The month of May: the birds are chirping outside, the weather is finally becoming warmer, and summer is so close you can taste it. During this month, you may notice your students have become more disruptive and excitable than usual. They can sense their freedom is right around the corner. Tip #1: Often, inappropriate behavior can be avoided or pre-empted. If you’re dealing with interruptions, noise, etc. It is usually used at the beginning of the year to establish procedures. 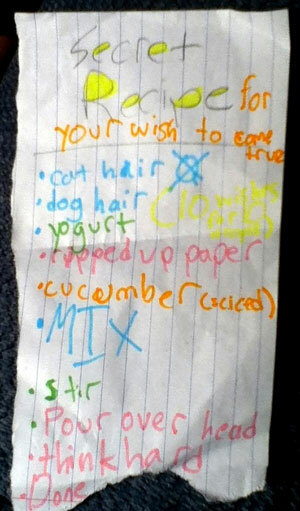 Think about the highlighted items. Refreshing these procedures might be just what you and your students need. Tip #2: Be sure students know what to do when they finish writing. Some teachers have allowed students to get up and get a book; others have limited walking around. Whatever you decided earlier, reinforce it now. If it is not working, try a new routine. Maybe you want to restrict movement, maybe you want to loosen up a bit. Whatever you plan, make it clear to your students, role play it if necessary, and be consistent. This is one out of the four “Topics I Can Write About” visual aids you will receive. 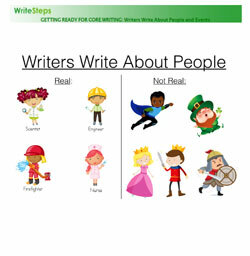 Tip #3: WriteSteps coaches encourage teachers to keep students writing during writing time. You may want to introduce some new writing activities to keep your students excited! There are many examples of writing ideas on the “Topics I Can Write About” visual aids in Unit 1. Now would be a good time to revisit some of those resources! Whatever you decide, be clear. 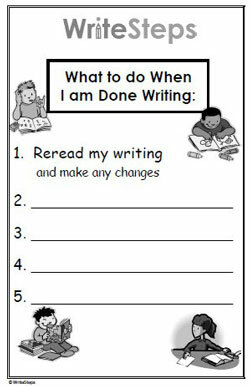 Display your class expectations using the What to Do When I’m Done Writing poster to support good classroom management. Tip #4: Reiterate procedures to help students work independently. Some things like stretching out words and using the word wall on the WriteSteps privacy folders might have been routine a couple of weeks ago, but with spring here, these practices might need some brushing up. Tip #5: If you find that your students are ornery and are having difficulty following the classroom rules, try creating an anchor chart together that focuses on the important classroom procedures. Consider these titles: When is it Okay to Interrupt Writing Conferences? or When I’m Done, I’ve Just Begun and allow students to brainstorm and share ideas to keep them busy while you are not available to them. Tip #6: It’s a great time to start to think about how you will celebrate your students’ accomplishments this year. See the “Technology Docs” in Pre-Unit 1 for some creative ways for students to share and publish their writing. Give them a chance to look back at old writing pieces and appreciate how much they’ve grown as writers. Beta testers are needed this summer for a new curriculum partnership! WriteSteps is teaming up with Write About to create a blended learning, digital writing program for students. Why should you become a beta tester? You’ll be the first to see a sample of the program that will be available to WriteSteps customers in grades 3-5 in the new school year. 4th Grade classrooms will gain free access to a WriteSteps Research Writing unit presented to students via video lessons and integrated with Write About tools! You can use it in your classroom or just look it over to see what is coming up. It’s perfect for targeting Research Writing during Summer School! Sign-up by May 31 to participate! WriteSteps Named a 2016 REVERE Award Finalist! We are thrilled to announce that eWriteSteps was named a finalist for the 2016 REVERE Awards in the Classroom Competition Whole Curriculum Category/Reading and Language Arts subcategory. The REVERE (Recognizing Valuable Educational Resources) Awards recognize creative resources that engage 21st-century teachers and learners. Produced by the Association of American Publishers (AAP) PreK-12 Learning Group, the awards are the only ones of their kind to recognize learning resources in all media, for all ages, and cover a wide array of educational subject areas and learning environments. REVERE Award finalists were chosen by evaluation of quality content and design, audience engagement and appropriateness, usability and originality, along with comments and recommendations given by judges. More than 100 evaluators in the education and publishing industries judged the applications. What’s your secret recipe for your dreams to come true? Do you have a funny student writing piece you can send us? If so, send it to [email protected] to be featured in an upcoming eNewsletter!